Today is the state’s 170th birthday. Governor Terry Branstad, who describes himself as a history buff, says it was then-President James K. Polk who signed the bill into law granting Iowa statehood. 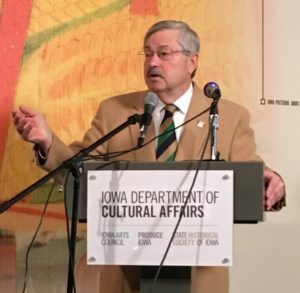 “We became a state on December 28th of 1846,” Branstad said during a recent news conference at the State Historical Museum in Des Moines. Slavery was an issue at the time Iowa entered the union. Iowa was a “free” state where slavery was not allowed. Branstad, who was governor back in 1996, spearheaded a big celebration to mark Iowa’s 150th birthday — the sesquicentennial. A University of Iowa professor has come up with a Latin word for the 170th birthday. The Iowa Department of Cultural Affairs asked some famous Iowans to say it. Ames native Fred Hoiberg, the former Iowa State basketball coach who’s now coaching the Chicago Bulls, is the first to take a shot at the word on the video. Senator Chuck Grassley takes a pass in the video. Congressman Dave Loebsack did give it a go. Governor Branstad told reporters earlier this month he’s not going to try to say that “tongue twister” but he credits Loebsack for “doing a pretty good job” in pronouncing it. Branstad turned 70 in November. He was born during Iowa’s centennial year — 1946. Twenty-three Iowans have received the award. Former President Herbert Hoover, a native of West Branch, Iowa, was the first recipient. The most recent Iowa Award winner is businessman and philanthropist John Pappajohn.